This is probably the only area which gives nightmares to Reverse Osmosis system owners. Membrane fouling is a common term heard all through the life cycle of a reverse osmosis system. MONTCLAIR, Calif., May 6, 2018	(Newswire.com) - Be it household RO or industrial and military level desalination systems, almost every one of them is prone to biofouling. While avoiding membrane fouling can be achieved through strict and timely maintenance procedures, advances in technology that reduce the effort are always welcome. Such technological innovations have probably led to resistant materials that will thereby reduce the stress of cleaning on the consumers. Biofouling happens when a membrane surface is covered by microbial colonization. Once these organisms attach themselves permanently to the walls of the membrane, these organisms release extracellular polymeric secretions. Comprised of majorly polysaccharides, lipoproteins and glycoproteins, the secretion adds to the formation of a layer of a biofilm. This can be seen quite easily on the membrane surface of a used RO at your home. This results in lesser permeate flux, decrease in lifespan and in turn, an increase in operational cost. For a long time, scientists and engineers have been struggling with an answer for this and they probably have come up with one. Today, thin film composites are used as membranes for desalinating water. These are ultra-thin polyamides with microporous substrates. The characteristics that it features are harshly affected by the microbial foul and adhesion. There are a lot of ways through which the foulants absorb the membrane surface and these are through hydrophobic interactions, Lewis acid-base interaction, hydrogen bonding, Vander walls attraction and electrostatic repulsion. This interaction is hence taken into consideration while developing a membrane material that is foul resistant. Can biofoul resistant membrane be made available? A temporary solution for the problem is a modification of the thin film composite in order to decrease its roughness, increase its surface hydrophilicity and change the electrical charge of the membrane so as to make it the same as the bio foulant. Anti Adhesion elements: Like Polyethylene Glycol, Natural Hydrophilic polymer sericin, hyperbranched polymers etc. Antimicrobial elements: Like Antimicrobial polymers, incorporation of antimicrobial elements into the membrane structure etc. Recently many more strategies have been suggested to make changes in the structure and production of thin membranes. Some of these are a surface coating or grafting of hydrophilic elements. A common approach nowadays for many is to coat the membrane with PEGylated polymers due to its simplicity. A major portion of the experts prefers membrane induced by antimicrobial elements. This is because it increases surface functionalization and reduces wearing out of the surface coating. Another unintended advantage of this inducing is fewer pollutants in the rejected water leading to safe environmental standards. Another suggestion that comes out the way is the use of biocidal inorganic substances on the membrane. This includes silver and copper nanoparticles, carbon nanotubes and graphene. However, the challenge lies in the nanoparticles losing their functionality over a period of time. Therefore producing a thin film composite membrane is very difficult and tricky. Needless to say, membrane technology has seen advances in other aspects of efficiency, but with biofouling in place, the membrane can never work at its full potential. The aim here has to be of producing bio foul resistant membranes that need no external chemical to clean itself. Be it by surface coating of incorporation of the antimicrobial element, in one way or another making membranes more effective and less maintenance could be a priority of these times. Ampac USA is a leading manufacturer of advanced reverse osmosis water treatment systems. For over 30 years the company has been providing its customers and clients around the world solutions to their water treatment problems. 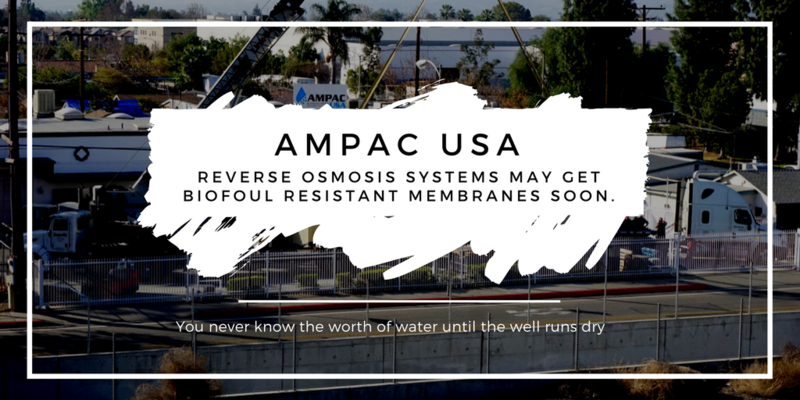 With years of an impressive track record, Ampac strives to develop solutions to make reverse osmosis systems, advanced for improved quality and cost efficiency.